We work hard and like to have fun. In Year 2 we become much more confident in reading, writing and maths and we are encouraged to become more independent in our learning. We also continue to learn creatively through our topic work. Year 2 is taught by Ms Etienne (Mon – Thurs) and Mrs Richards (Fri). They are supported by a team of dedicated Teaching Assistants: Mrs Willits, Ms Raval, Ms Oakes, Mrs E. Williams and Mrs Atkinson, who help to teach all of our children by leading groups and supporting individuals. Parents are always very welcome to come in for a chat after school. Below you can find more general information about the learning in year 2. Literacy: We take writing very seriously in Year 2. We begin to gain confidence and stamina in writing and make it an integral part of our school day. Some of our children will be learning to read and write using our phonics based programme called Read Write Inc. We learn all of our sounds and some very good spelling strategies too. You can read more about our exciting programme by clicking here. We also do one piece of sustained writing every week as part of our Big Write programme. We play games and do lots and lots of talking about our writing so that we are fired up and ready to write. We do ask parents to do one piece of “Talk” homework to help our children get ready for Big Write on a Friday. It’s a wonderful calm atmosphere and our children just love writing. Read more by clicking here. We often write about topics we are learning about in class, or events in school and we use our trolley of laptops and our ICT skills to publish them. Science: In Science we develop our investigation skills through exploring different topics. For example we learn about plants and insects, how to keep our bodies healthy and how materials change when they are heated or melted. We learn through applying our skills to lots of practical activities and we develop our Maths skills by finding ways to measure and record results. 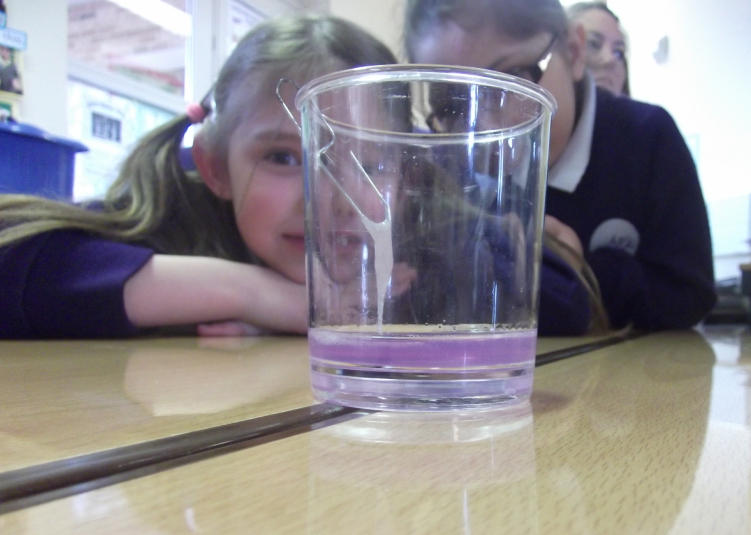 Learning about genetics in Science week – extracting DNA from a strawberry! History/Geography: Through our History topics we find out about people and events from the past such as Guy Fawkes, the Victorians and Seaside Holidays. In Geography we explore the local area and find out about other countries. RE/PSHE : At Ridgefield we feel it is very important that everyone feels happy, safe and respected and this is reflected in the RE and PSHE curriculum. We explore our feelings, ways of keeping safe and learn about different religions. ICT: ICT in year 2 is not taught as a separate subject. We teach ICT skills through almost every other subject in our curriculum. We want our future citizens to be ready to cope with the technological changes they will be faced with and we use a range of ICT equipment from digital video cameras, to laptops, software programmes, robots, microphones. We complete videos, sound recordings, graphs, images and animations throughout the year. PE: We like to keep fit and healthy in Year 2! In PE we create dance movements, develop our bat and ball skills and become really confident in using the big apparatus. Home school reading books should be changed daily by the children – please let us know if they are bringing the same book home or if you feel that it is an inappropriate level. PE clothes are needed on Monday and Tuesday – please remove any earrings. Homework is usually sent home on a Wednesday and returned on a Monday. Talk homework is sent home on a Wednesday ready for the Friday. Please take some time to support your child with their homework! At the start of the school year we set and agree our class rules and we work hard at following them. We use a four stage approach to managing behaviour and you can find out more by downloading our school behaviour brochure. Praise, stickers and house points are all used for rewards. Please celebrate your child’s achievements, they work very hard indeed. Star of the Week is celebrated in assembly and good lunch time behaviour, by the whole class is rewarded by winning a beautiful silver cup to keep in our classroom. Here is our Code of conduct below. We are always looking for volunteers to hear children read. Please let us know if you have an hour to spare!